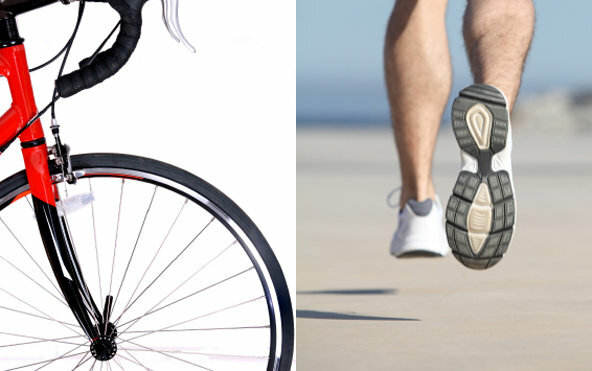 How does bicycling or spinning compare with running or walking as an exercise for health or weight loss? But there are differences, which could sway you toward one activity over the other. In general, running burns more calories per minute than cycling, Dr. Tanaka said, although the differential slims if you cycle vigorously. According to broad calculations from the American College of Sports Medicine, someone weighing 150 pounds who runs at a brisk seven minutes per mile will incinerate about 1,000 calories per hour. That same person pedaling at a steady 16 to 19 miles per hour will burn about 850 calories. Meanwhile, walking requires far fewer calories, only about 360 per hour at a 4-mile-per-hour pace. Strenuous running and cycling also can equivalently dull appetite, at least temporarily. In a study published earlier this year, healthy, active men were assigned to run for an hour on one day and on another, to ride vigorously for the same amount of time. During both activities, the men’s blood levels of ghrelin, a hormone known to stimulate hunger, fell, compared with when they sat quietly. But running has a downside: Injuries are common. Biking, meanwhile, is gentler. “Cycling is a nonweight bearing activity, so it is better for your knees and joints,” Dr. Tanaka said, “and it does not cause much muscle soreness.” Walking, likewise, results in few injuries, unless, like me, you are almost comically clumsy. Any of these activities, however, will improve your aerobic fitness, and greater aerobic fitness is closely linked to a reduced risk of chronic disease and a longer life span. But any physical activity will improve health compared with performing none, he said. So walk one day, maybe jog another, and borrow a bicycle or join a spinning class on still another. Whichever activity you enjoy the most and will stick with is the best activity for you. This entry was posted in Health and tagged Biking, Running by admin. Bookmark the permalink.